Christmas is just around the corner and that means it's about time to start thinking about New Year's Eve. Growing up, I can remember trying so hard to stay up until midnight only to fall asleep. A few years, I made it to twelve and loved banging on pots and pans for all the world to hear. Last year, we had a fun family night in the middle of Luke's chemotherapy treatments. We were discharged just in time to be home for the new year and unfortunately had to return on New Year's Day. This year, we are so excited to be visiting Knott's Berry Farm on New Year's Eve! Our favorite California theme park has so much going on at the park to help guests usher in a festive 2016. Knott's will be open from 10:00am to 1:00am on New Year's Eve. So if staying till the very last minute the park is open is your thing, you will have plenty of time to spend at the park. As the final moments of 2015 countdown, look skyward towards the signature "K" tower. The Knott’s Sky Cabin will rise to the top of the “K” tower with special lighting effects on the countdown to twelve o'clock. When the cabin reaches the top of the famous "K" tower, the skies above Knott’s Berry Farm will ignite with a spectacular fireworks show! The New Year’s Eve Celebration is included with regular daytime admission. Music, Dancing, Entertainment, Oh My! Jumpin’ Joz Band and Memories Swing Dancers Jump and jive to the sounds of Jumpin’ Joz. Swing into the New Year with style as you cut a rug with Memories Swing Dancers. You will even have the opportunity to learn a few moves from the experts. • THE REFLEXX is the best 80’s new wave cover band around who cover songs from bands such as Depeche Mode, Simple Minds, Tears for Fears, A-Ha, The Cure, Duran Duran, and more. • DJ Howly will be rocking it out in Calico Square. His eclectic mix of high energy music will have you ready to count down the clock. And Calico Square offers a great view of the Midnight Fireworks Spectacular. • Family friendly comedian, Taylor Hughes Don't miss Taylor and his hilarious comedy, magic and fun audience interaction at the Boardwalk Ballroom. • Midnight Fireworks Spectacular Bang, Pop, Pow! Look to the western skies for an aerial fireworks display just off the well beloved "K" tower. And don’t miss the spectacular countdown to midnight on the Sky Cabin tower. 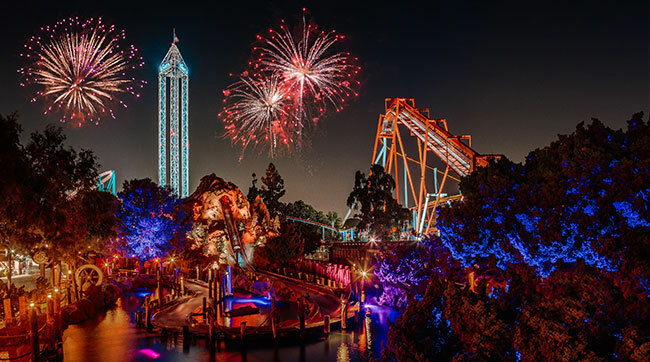 2016 Knott’s Berry Farm Season Passes are a great way to visit on New Year’s Eve. 2016 passes offer a year of family fun and includes one free visit in 2015, including New Year’s Eve!! For a limited time, Season Passes can be purchased online for just 6 easy low payments of $13.50 each. This is the best price of the year so I am told. And if you do decide to do the season pass, be sure to get the meal pass - it's a great deal! You can follow the Knott's Berry Farm New Year's Eve fun on Social Media, by following the hashtag #KnottsNYE on your favorite social media platform! *Disclaimer: I was provided with tickets to Knott's Berry Farm New Year's Eve event in exchange for sharing with you about all that Knott's has to offer. Thank you to Gigasavvy. All opinions in this post are my own, but if you've read any of my previous posts - you know I have been a Knott's fan since I was a little girl.